On 29 July 2014, when Flipkart, India’s largest e-commerce marketplace, said it had raised $1 billion in funding, the world sat up and took notice. On 26 February, when Morgan Stanley Institutional Fund Trust, a minority investor in Flipkart, disclosed a write-down in the value of its holdings in the company by as much as 27%, the world again sat up and took notice. The first marked the beginning of the India e-commerce story in global investor circles, and the second may well mark the beginning of the end. To begin at the beginning, the July 2014 fund-raising, one of the largest ever by a venture capital-backed company, came out of the blue and signalled that Internet companies in India were onto something good. The good times lasted 15 months. Indian entrepreneurs and start-ups never had it as good as they did in that period. In those 15 months, investors pumped in more than $9 billion into India’s e-commerce firms, betting that the country was well on its way to spawning the next Alibaba, the Chinese e-commerce giant that went public in September 2014 at a valuation of more than $200 billion. After all, India had all the ingredients for a boom in Internet commerce—a large and young population with rising incomes and rapid growth in smartphone sales and accompanying mobile Internet connections. Overall, in 2015, smartphone shipments to India grew 28.8% to reach 103.6 million, according to market researcher International Data Corp.
Flipkart, many said, would be the next Alibaba. Soon after the Alibaba initial public offer (IPO), Flipkart, too, changed its role model (and business model)—to Alibaba from Amazon. For a while, it seemed that prediction wasn’t as outlandish as it originally sounded. Flipkart’s valuation jumped five times to $15.2 billion in July 2015 from May 2014. In that time, it raised some $2.6 billion and added marquee investors such as Russia’s DST Global, Qatar Investment Authority and T. Rowe Price to its roster. The first sign of trouble actually surfaced in early 2015 when Flipkart was trying to raise $700 million from investors and it wanted a part to come from new investors. 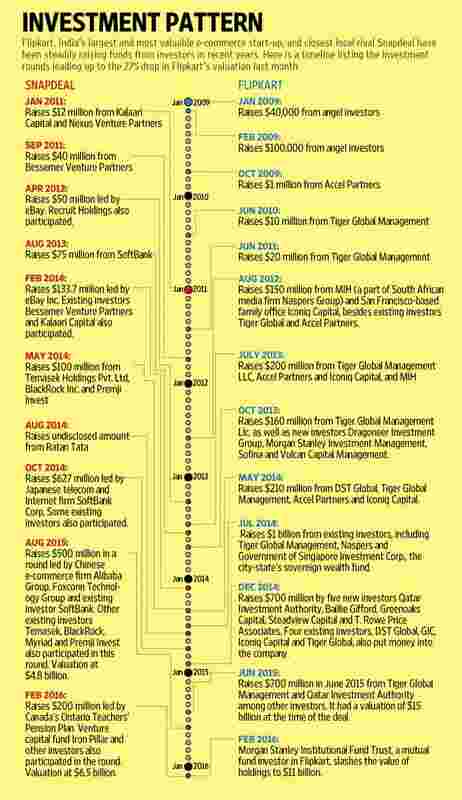 However, despite being in talks with potential new investors since March 2015, it was unable to come to terms and, eventually, existing investors led by Tiger Global Management pumped in the entire $700 million by June. Then there was a meltdown in the Chinese stock markets and Chinese Internet stocks in the US collapsed. Alibaba Group’s stock plunged nearly 40% in September 2015 on account of slowing growth and question marks over the company’s accounting policies and business model. That same month, Barron’s, a US financial weekly, predicted Alibaba’s stock could fall up to 50% and criticized the company’s accounting and corporate governance standards. It claimed the company’s high user numbers were inflated. Alibaba fired back and said Barron’s article contained “factual inaccuracies and selective use of information, and the conclusions (it) draws are misleading". Still, what was happening to Alibaba had implications on Indian e-commerce firms. Alibaba’s record IPO helped trigger the start-up funding boom in India. Investors who missed out on Alibaba or were enriched by it were hungry for the next big thing and queued up to invest in India’s fledgling Internet companies. As a result, there are some close connections between Alibaba and India’s e-commerce business. SoftBank, Tiger Global and DST Global, all three of which are currently writing the largest cheques for Indian e-commerce firms, backed Alibaba. Another shareholder in Alibaba, Temasek Holdings Pte. Ltd, which is Singapore’s state-run investment firm, is an investor in Indian e-commerce as well as a limited partner (LP) in some VCs. LPs put their money into VCs, which in turn back start-ups. Even as Alibaba’s stock was plunging, Amazon was making big strides in India. The company, which is desperate to dominate India after losing out in China to Alibaba, pumped millions of dollars into advertising, discounts and logistics to win over shoppers. Since launching in India in June 2013, Amazon has applied its mantra of low prices, wide product selection and fast and reliable delivery to gain popularity with shoppers. Signalling the company’s intent in India, in July 2014, Amazon chief executive Jeff Bezos promised to invest $2 billion over time. Amazon India is making full use of that. It is outspending Flipkart and another local marketplace, Snapdeal (run by Jasper Infotech Pvt. Ltd), on everything from discounts to ads. Over the course of 2015, Amazon gained market share in India at the expense of both Flipkart and Snapdeal, according to publicly available data and several company executives. While Amazon could afford to spend freely, Indian firms didn’t have the same luxury. They would have to list their shares some day to return money to investors. And to go public, their finances would need to be in better shape. Flipkart reported losses of about ₹ 2,000 crore in the year ended 31 March 2015 for the two main entities controlled by it. Closest rival Snapdeal posted a loss of ₹ 1,328.01 crore. Late last month, courtesy Morgan Stanley Institutional Fund Trust, Flipkart got its first taste of the exacting standards of US stock markets, where it hopes to list. The mutual fund reported it was writing down the value of its stake in Flipkart by 27%, in a filing with the Securities and Exchange Commission (SEC), the US stock markets regulator. Morgan Stanley’s latest estimate implies it values Flipkart at $11 billion. The mutual fund’s markdown confirms reports of a correction in valuations of India’s e-commerce companies, including Flipkart. Morgan Stanley’s filing comes nearly two months after Flipkart appointed co-founder Binny Bansal as its new chief executive officer, replacing Sachin Bansal, who became executive chairman. Analysts said Flipkart made the change to increase its focus on keeping arch-rival Amazon India at bay. The markdown is significant not only because it proves Flipkart’s valuation had run ahead of itself, but also because mutual funds comprise one of the largest institutional buyers of shares in stock markets. At least two other mutual funds, T. Rowe Price and Baillie Gifford, are investors in Flipkart. T. Rowe Price hasn’t yet reported the latest estimated value of its stake in the company. Given that Flipkart is expected to list its shares in the US at some point, the valuation estimates of the mutual funds will be an important indicator of how stock market investors will value the company. “Growing at negative operating margins to raise money in quick succession is a destructive style of doing business," said Kashyap Deorah, serial entrepreneur and author of The Golden Tap, a book on India’s hyper-funded start-up ecosystem. “It kills the ecosystem... to build a thriving long-term business environment, we need to get off the addiction of global funds buying market spaces in India-like territory." Deorah predicts Flipkart’s valuation will eventually slump to the amount invested in it. Flipkart has raised anywhere between $3 billion and $3.5 billion. “The downward trend will continue until Flipkart’s valuation equals invested capital," he said. Deorah’s prediction may seem extreme, but he is hardly the only one predicting a slump in valuations of Indian e-commerce companies. Binny takes over at Flipkart when it is potentially facing its toughest test, even for a company that is all-too-familiar with volatility and adverse market conditions. Flipkart is engaged in a high-stakes market share war with Amazon and Snapdeal, the outcome of which will help shape the future of India’s entire start-up ecosystem. There’s so much investor wealth locked up in Flipkart, which is also seen as the best-run start-up in the country, that it is institutionally key for the start-up business to continue flourishing. If Flipkart is able to keep Amazon at bay, it will be seen as a strong validation of local entrepreneurship. If Amazon, however, becomes No. 1, Flipkart will have to find a new place for itself in the eyes of investors, or risk seeing its lofty valuation get eroded. To be sure, Flipkart is still the largest e-commerce firm in the last remaining big e-commerce market in the world. It has a solid brand, a strong leadership team and deep-pocketed investors, among other strengths. “Flipkart’s valuation may look stretched at $15 billion in this current environment, but you can’t take away the fact that the company still has a solid business," a Flipkart investor said on condition of anonymity. “In the worst-case scenario, it may take the company a year or two to grow into that valuation. But it will definitely happen. And if the market sentiment becomes better, it will happen sooner," the investor added.